We have a modern, well equipped consulting room with level access from our back door opening on to Water Street car park. Eye examinations are carried out by Fiona or one of our other regular optometrists and take around 30 minutes. We will sometimes advise a peripheral vision test is carried out afterwards by one of the other staff in our adjacent equipment room. 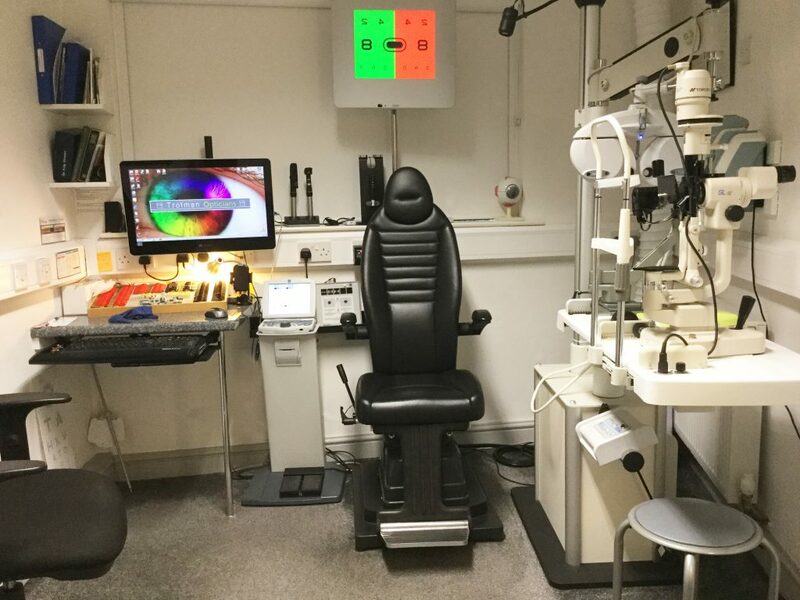 You will also have the chance to choose to have an OCT scan of the back of your eyes in the same room, this gives a hugely enhanced view of the back of your eye and the underlying layers; it’s quick and easy, just like having a photograph taken. A recent investment has been an automated refractor head- it holds all the lenses and you look through the eyepieces. 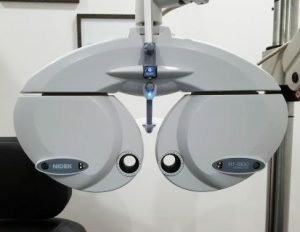 This makes it easy to arrive quickly at an accurate spectacle prescription without you having to wear the usual testing frame and lenses that some people find a little heavy. The practice doors are wide enough to allow access for wheelchairs and mobility scooters. For anyone who is unable to transfer into the examination chair, our consulting chair can be quickly wheeled out of the way to allow a wheelchair to be put in its place. We have a range of picture testing charts specially designed for small children, a child-sized small frame for lenses, several fun 3D test options and stickers for all achievements! As experienced optometrists we know that sometimes children just don’t want to take part and when this happens, no problem, we’ll just test what we can and book you in again on another day or a little while later. Children soon get used to an eye tests if they come regularly. Of course some of them don’t want to leave without a pair of glasses! But we’re used to that too, it’s all part of the varied optometric day! We have an Intuitive Overlays Test kit and a Wilkins Rate of Reading Test. These are scientifically designed to allow an assessment of whether or not a person is likely to benefit from using a coloured overlay at home or school when reading. Around 20% of children with reading difficulties find that using a coloured overlay is helpful. A seperate appointment is required for this assessment and it is best to have an up to date eye test first.